When your pregnancy cravings veer away from the "usual" pickles and ice cream and into the unusual, safety is a concern. If you contract a food-borne infection, you can pass it along to your developing baby. Foie gras, whether eaten plain or seared, has a few potential health dangers, so it's wise to talk to your doctor before digging in. 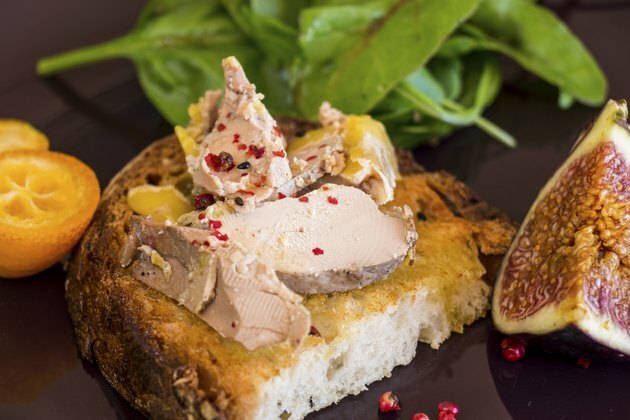 Foie gras means "fat liver" in French, and the name is apt. This dish is made from the livers of either ducks or geese which have been fattened before being slaughtered. The livers are turned into a creamy paste that can be spread or cut into slices. Foie gras is a type of pate, which is a broad term for any spreadable meat paste. The dish is generally served cold, but can also be seared, or cooked for a short time at a high heat. If your doctor gives you permission to eat foie gras, choose your dish carefully. The Centers for Disease Control and Prevention does not recommend eating refrigerated pate, but canned or shelf-stable options can be safe. Searing the foie gras isn't enough to kill any bacteria. Searing creates a cooked crust on the outside of the foie gras but won't cook the dish all the way through, so bacteria can still lurk inside. A listeria infection, or listeriosis, is the major concern associated with eating foie gras or any type of pate. These bacteria can be found in undercooked meats, soft cheeses and unpasteurized milk as well as in pate. A pregnant woman who eats listeria can pass the bacteria on to her baby, which can cause stillbirth or miscarriage. According for the Centers for Disease Control and Prevention, listeriosis causes flu-like symptoms at first. When it spreads, the infection causes confusion, headaches and convulsions. Antibiotics can treat the infection. Another health concern associated with eating any type of liver is vitamin A. As a pregnant woman you do need this nutrient, since it aids in your baby's embryonic growth and helps your tissues repair after you give birth. Too much vitamin A, however, can cause birth defects, and liver contains far more of the vitamin than any other food source. For instance, according to BabyCenter a three-ounce serving of beef liver contains 12 times the daily recommended dose of vitamin A. If you do opt to eat seared foie gras, eat no more than a few tablespoons a day to keep yourself and your baby safe.